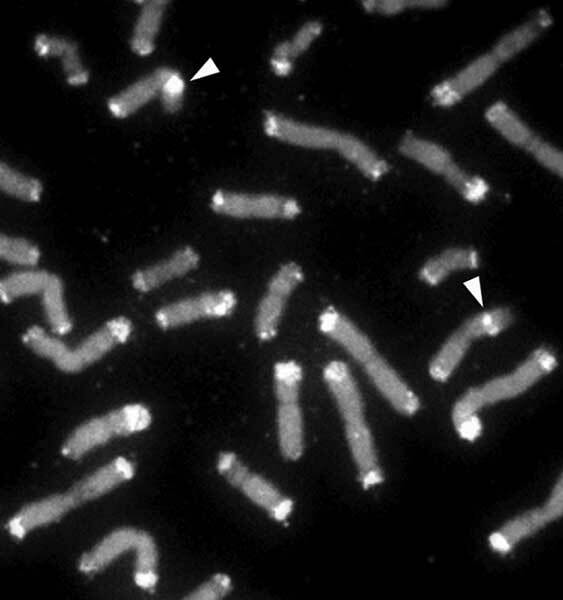 The siamang Symphalangus syndactylus, a species of the family Hylobatidae (gibbons), carries large blocks of constitutive heterochromatin in the telomere region of chromosomes. We recently found that alpha satellite DNA constitutes these heterochromatin blocks as a main component. Alpha satellite DNA, tandem repeat sequences of 171-bp repeat units, is a major component of centromeres in primates. In addition to siamang, the white-cheeked gibbon Nomascus leucogenys was previously found to carry the alpha satellite DNA in the telomere region, although not as large a scale as the siamang. Gibbons comprise 4 genera: Hoolock, Hylobates, Nomascus and Symphalangus. Here we report that the amplification of alpha satellite DNA in the telomere region is probably confined to 2 genera: Nomascus and Symphalangus. We examined 1 species of Hoolock and 4 species of Hylobates, and obtained evidence against such an amplification event in these species. The phylogenetic relationship of the 4 gibbon genera remains unclear. One simple explanation for the current distribution of the telomere region alpha satellite DNA would be that Nomascus and Symphalangus are relatively closely related and the amplification occurred in their common ancestor. Genome 55 (2012): in press.